When choosing the perfect instant messaging it is worth considering Verbs app. It is an instant messaging client that is now available for both iPad and iPhone. This app includes support for MobileMe, Facebook, AIM, and Google Talk. Instant messaging with Verbs is really sleek and direct. 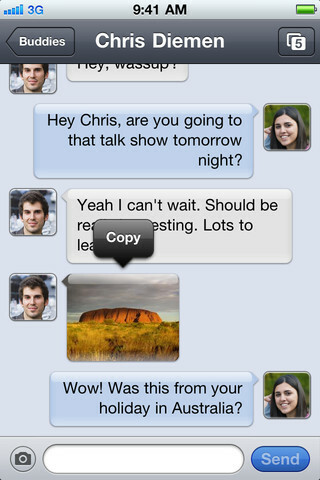 Also the app has WebOS card-like capability that allows easy switching across chats. Among other supported services are Droplr and CloudApp for sending images, Office and iWork document viewer, Instapaper and capability to link you Gtalk and AIM friends with your Address Book. Verbs can be purchased on iTunes App Store for $0.99.